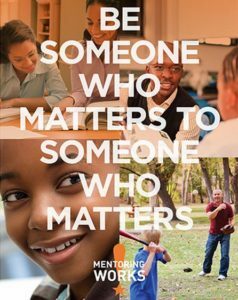 The National Mentoring month happens in January of every year. Encourage organizations to engage and integrate quality in mentoring into their efforts. In 2002, the Harvard School of Public Health and MENTOR: The National Mentoring Partnership created National Mentoring Month. Albert Lea was proclaimed as National Mentoring Month in January of 2016. This Proclamation was signed by Mayor Vern Rasmussen at the Albert Lea City Council Meeting in January, 2016. To learn more about National Mentoring Month, the national website for mentoring has more information. Quality mentoring programs have show to be effective combating school violence and discipline problems, substance abuse, incarceration and truancy. Research shows that young people who are at risk for not completing high school but who have a mentor were 55% more likely to be enrolled in college, 81% more likely to participate regularly in sports or extracurricular activities, more than twice as likely to say they held a leadership position in a club or sports team and 78% more likely to volunteer regularly in their communities.